Imageries of the of the Mother and Child are often used in traditional Christmas cards but our modern versions seem to omit a fruit that has Christian symbolism. The pomegranate was often featured alongside the Virgin Mary and the infant Jesus in artworks from the 15th century, with many famous artists such as Leonardo da Vinci and Sandro Botticelli creating numerous art pieces that explore this theme. 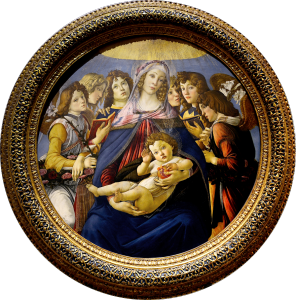 The Italian Renaissance painter, Sandro Botticelli, painted the ‘Madonna of the Magnificat’ and the ‘Madonna of the Pomegranate’. In both paintings, mother and child hold a split pomegranate revealing its blood red seeds. The National Gallery in London holds ‘The Virgin and Child with a Pomegranate’ by the same artist. The Unicorn Tapestries (a series of seven tapestries depicting the hunt of the Unicorn) kept at The Cloisters, New York (part of the Metropolitan Museum of Art) has many symbols with secular, pagan and Christian meanings. 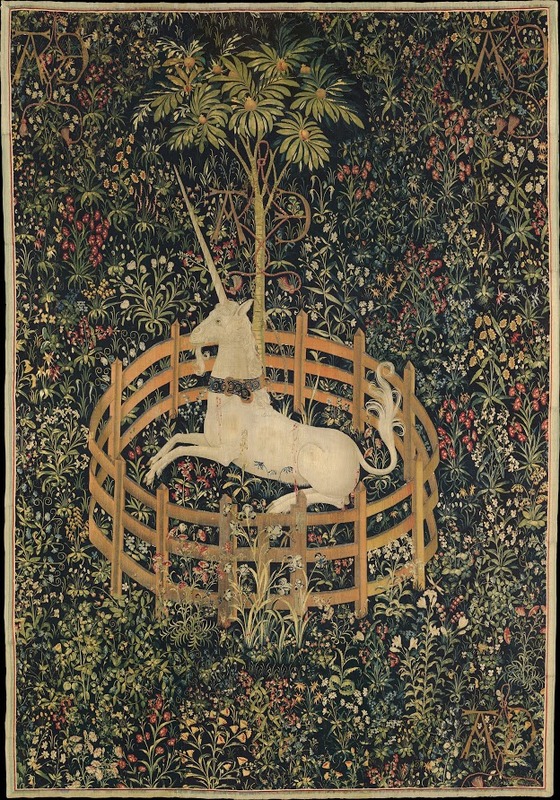 Some of them feature the pomegranate tree and fruit, though not always depicted botanically accurately, such as in the case of tapestry 7 : The Unicorn in Captivity. The tree has been stylised to a point that some scholars believe that it is not a tree that exists on Earth, although the fruit depicted is clearly the pomegranate. Just like the paintings, the pomegranate in the tapestry is portrayed partly open and, in this case, with its seeds and juices dripping onto the Unicorn below. It is believed that the unicorn is a symbol of Christ and in tapestry seven, the Christ resurrected in Paradise. The Unicorn in Captivity (via Wikimedia Commons) features the Unicorn resting under a stylized pomegranate tree. Some scholars believe the Tree of Life in the Garden of Eden to be a pomegranate tree. The pomegranate can also be taken as a symbol of the passion of Christ. The melancholic expressions of the angels and the Virgin in the Madonna of the Pomegranate may be taken as an indication of the suffering Christ is to face as an adult. The red juice of the pomegranate symbolises the blood of Jesus and the bursting fruit and seeds, his resurrection; as depicted in the tapestry. The Pomegranate is also an old symbol of fertility and marriage. This could be related to the Greek Mythology of Persephone who bound herself to Hades, God of the Underworld, by eating pomegranate seeds after her abduction. Her enraged mother Demeter, the Goddess of Harvest, promised to make the land bare until the return of her daughter (this period symbolises autumn and winter). Zeus, Persephone’s father, struck a deal to allow Persephone to return to her mother for a few months of the year. Her return marks the start of spring and the return of bountiful crops (a rebirth and resurrection of nature). The pomegranate symbolises good luck to the Greeks. After worshipping at church on New Year’s Day, a pomegranate is broken at the corner of the house by the head of the family and a wish is made that blessings as numerous as the seeds of the pomegranate be bestowed on the family. These symbolisms are incorporated into the coat of arms of several medical and allied healthcare professional bodies here in the UK, namely the Royal College of Midwives, the Royal College of Obstetricians and Gynaecologists and the Royal College of Physicians . The pomegranate has historic medicinal use as described by Dioscorides. He recommended a concoction of pomegranate juice and honey for ulcers, and a mixture of the rind and root bark for tapeworm infestation [1, 2]. With the advancement of science, we are now able to identify the chemical constituents that make up the pomegranate and their potential use and benefit. Here, we describe a couple of examples of the chemical constituents of pomegranate. The cold pressed seed oil from pomegranates contains low concentrations of common fatty acids (palmitate, oleate, stearate and linoleate) and a high concentration (65 % of total fatty acids) of an unusual fatty acid called punicic acid ((9Z,11E,13Z)-octadeca-9,11,13-trienoic acid) . The unusual nature of punicic acid is not only that it is a conjugated fatty acid (one that has a series of unsaturations/olefins separated by a single bond), but it has a combination of cis and trans double bonds. A recent review suggested that punicic acid might be considered a nutraceutical substance . The review summarised anti-inflammatory and anti-obesity profiles from preclinical models, which suggest that dietary supplementation with this compound, presumably in the form of pomegranate seed oil, could be advantageous in the treatment of metabolic disorder. Polyphenols are common components of plants and are present in the human diet in daily quantities in the gram range. Often they are found as glycones, which are derivatives which have sugars bound to them. The processing in humans of these polyphenol glycones, such as punicalin appears to involve deglycosylation in the gut and re-glycosylation once absorbed. Further metabolism through the resident symbiotic bacteria in the colon has also been proposed. Methanolic extracts of the pomegranate were identified to include punicalin amongst many other polyphenols. In an in vitro test, punicalin and other pomegranate-sourced polyphenols, were observed to inhibit carbonic anhydrase activity with a potency similar or slightly higher than acetazolamide, an agent used clinically to inhibit carbonic anhydrase in the treatment of glaucoma and altitude sickness . 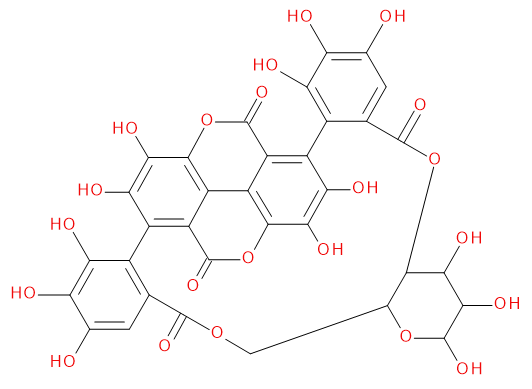 Punicalin was also able to inhibit cytochrome P450 enzymes of the CYP1 family with sub-micromolar affinity , an enzyme which metabolises xenobiotics, including prescription drugs. Concluding remark: Pomegranates have connotations of fertility in Mediterranean and other cultures, which has lead to an association with the Nativity and Christmas. A more modern understanding raises the possibility of finding new drug substances based on the natural products present in the fruit. Schubert, S.Y., E.P. Lansky, and I. Neeman, Antioxidant and eicosanoid enzyme inhibition properties of pomegranate seed oil and fermented juice flavonoids. J Ethnopharmacol, 1999. 66(1): p. 11-7. Shabbir, M.A., et al., Punicic acid: A striking health substance to combat metabolic syndromes in humans. Lipids Health Dis, 2017. 16(1): p. 99. Satomi, H., et al., Carbonic anhydrase inhibitors from the pericarps of Punica granatum L. Biol Pharm Bull, 1993. 16(8): p. 787-90. Kasimsetty, S.G., et al., Effects of pomegranate chemical constituents/intestinal microbial metabolites on CYP1B1 in 22Rv1 prostate cancer cells. J Agric Food Chem, 2009. 57(22): p. 10636-44. The Virgin and Child with a Pomegranate (1480-1500, Sandro Botticelli) https://www.nationalgallery.org.uk/paintings/workshop-of-sandro-botticelli-the-virgin-and-child-with-a-pomegranate , accessed on 4th December 2017. The author, Szu Wong, would like to thank Mr. Evangelos Karvonis (University of Nottingham) for discussions on the symbolism of the pomegranate in Greek Culture. I’m a UK-trained pharmacist, and an academic with cross-disciplinary interests. When not bogged down by the daily grind of academic life, I spend time pondering how pharmacy is portrayed in art and how much art is in pharmacy. In my spare time, I take the opportunity to talk about cats with my co-author and I’m still trying to convince him to research into the effects of catnip. I’m currently involved in a project studying how natural resources are used in skincare. I’m keen to collaborate, so do get in touch if you could benefit from a pharmacist on a project. Join me for a couple of days of interesting talks and a workshop on the 15-16th of February 2018 at the Royal Pharmaceutical Society in London. I’m a Fellow of the British Pharmacological Society with a long-standing interest in the molecular mechanisms of action of particular natural products and their derivatives. I started off my research career (like I start most of my days) with caffeine and moved on to quercetin, a flavonoid found in onions and apples (like I consume some days). Mostly nowadays, Cannabis-related agents are what fill my working days. They’re really interesting!